Being a creative person I have always dreamed that one day my children would be artists and today my dreams came true as my first born son started his first job as a "Sandwich Artist"following in the footsteps of our babysitter Miss K! I was very proud to drop him off this morning and he admitted to being a little nervous. I told him to turn his phone off, smile and not to touch any part of his body while making food to serve to the public. See there is the smile. First time for everything he made his Mommy lunch! Way to go I am so proud of you! He said the girls he worked with were awesome. Funny, patient and generally awesome. Drool now available in a sandwich..
Is that a subway sandwich in Levi's pocket or is he just happy to..no wait..it's a sandwich and a bag of chips. Eat yer heart out Jared the fat guy from Subway...Levi has a new way to loose the pounds...The Ketchup sandy...only half the calories...and still has all the great ketchup taste. Sit down Justin Beiber we have a new Canadian Artist of the year..Levi MF Cross ladies and germs. 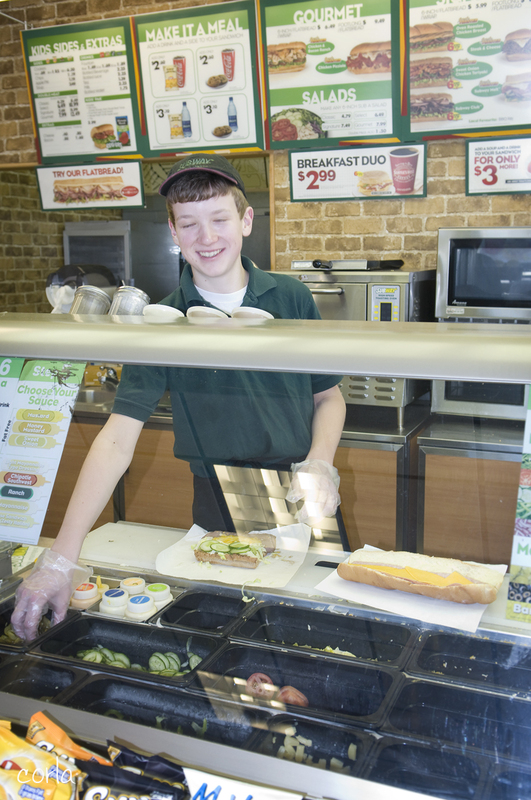 Green Subway shirt was white when he got to work. Was that Subway or Chubway? Overheard in back of Subway..
"Hey wait.. are you tossing all that freash bread and day old cookies?" "Not on Levi's watch good Sir"
"I think I will make this sandwich a meal again today"
"Two cookies and a pop ...don't mind if I do"
Maple Leaf Foods Inc makers of deli meats and bacon record record fourth quarter profits. Local teen burns Subway to ground to cover up chicken meat crimes.